From Neuromuscular Therapist Gadi Kaufman comes the long awaited book about how to relieve back pain using the pain-free approach called Strain Counterstrain Technique. 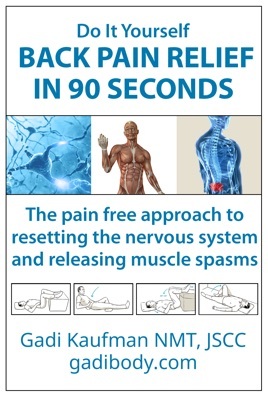 In this book, Do It Yourself Back Pain Relief in 90 Seconds, you will learn important information about lower back pain that you have not been told by the previous practitioners. For example, did you know that the majority of lower back pain does not actually originate in the lower back muscles themselves? In other words, when you feel lower back pain, the true source of that pain can often be traced to muscles and joints in the front of the body. Yes, that’s right: those tired and overused muscles in the front of the body can radiate severe pain to the lower back. This lower back pain quickly becomes chronic due to a chain reaction that occurs which limits mobility, twists and torques the spine, rotates the pelvis, and compresses hip sockets on both sides of the body. At the center of this chain reaction is a painful muscle spasm, which means the muscle has essentially shut down and stopped contracting and releasing. If this muscle spasm is left untreated, your lower back pain can persist for years. But now you can do something about it. In this book, Do It Yourself Back Pain Relief in 90 Seconds, you will learn how to use the passive and pain-free Strain Counterstrain Technique to release persistent muscle spasms and relieve your lower back pain -- in the comfort of your own home, and with no more equipment than your sofa or a chair. This technique is extremely gentle and doesn’t require spinal manipulations or uncomfortable maneuvers or deep tissue massage. You can relieve your pain without harsh medications, and without any additional pain during the process. The step-by-step instructions and illustrations in Do It Yourself Back Pain Relief in 90 Seconds focus on the specific muscles that are known contributors to lower back pain including: Psoas, Iliacus, Rectus Abdominus, Abdominal Obliques, Quadratus Lumborum, Piriformis, and more. With these 10 positional releases, you can begin to live again without lower back pain, which is something you deserve.